See our weekly review here. Join us for Super Thinking + Spanish Mar. 11-14. (Starts 9am in Mt. Dora Fl.) $749. Couple $999. Our Super Thinking + Spanish courses are Spanish course that goes way beyond Spanish. There is a way to learn Spanish that enhances health and wealth with Super thinking + Spanish. 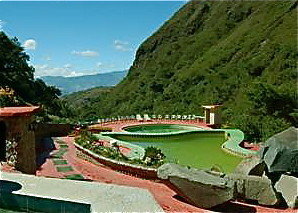 Super Thinking + Spanish courses are taught at Cotacachi museum in Ecuador. Spanish is the second most important language in the world. Yet the North American educational system does not teach how to communicate with or understand this culture. Nor does it teach how to untap the mind’s unlimited learning potential. This creates many one language people in a multi lingual world. To solve this problem many Delegates are enjoying a week in the Andean sun as they learn Spanish in a method so revolutionary that they will be able to communicate…and even dream… in Spanish… in just one week… plus know how to learn much more effectively in a way that even improves their health. They enjoy a week of direct equatorial sunlight and solve one of the biggest communications problems that faces English speaking civilization. Super thinking clears the memory plus enables a person to become skilled in Spanish (in just one week). This course teaches how to unlock the power of the untapped mind and applies this knowledge to speaking Spanish. 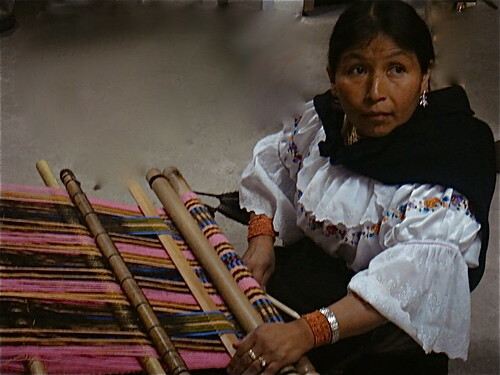 Merri Scott was among those few who learned and is licensed to teach the Lozanov system. Merri’s modified system teaches how to think and learn more powerfully in just a week plus Spanish. The learning system expands on Dr. Lozanov’s original work and offers new insights into tapping human potential, drawing from ancient and modern tactics for quick learning such as subliminal memory, music, nutrition, and productivity. 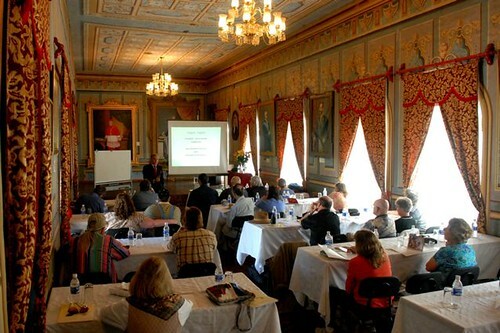 For example, the course evokes the power of the senses thus gaining super-charged memory. Ever hear a song from decades past and in a snap know all the words, the tune and remember with whom and where you heard it years ago? Learn how to use ten cycle music to put this ability to work all the time providing almost super human memory powers. Improved memory is just one benefit gained. The system teaches seven, easy to use learning techniques that help gain any skill, from computers to athletics to conversational languages… in much less time than traditional learning techniques. The Super Thinking course shows how to learn two-to-five times faster, in exciting and innovative ways…but most of all it is a system that is stress free and full of fun. The techniques help unlock the quantum potential that all people possess. This evolutionary program shows how certain types of music can enhance learning and how even altered nutrition can make anyone a startling 25% smarter, how subliminal messages can increase energy and thinking process, plus much, much more. This is a course that shows how to increase mental power for success in a 21st century that is overwhelmed by information. The system is built from old and new sources ranging from raja yoga to contemporary Russian science, and ultimate zone training already used by many Olympic champions. “Super Thinking + Spanish” presents new ways to use subliminal memory, music and much more to supercharge the mind. Knowledge is provided about smart food and super nutrition that enhances productivity and creativity. 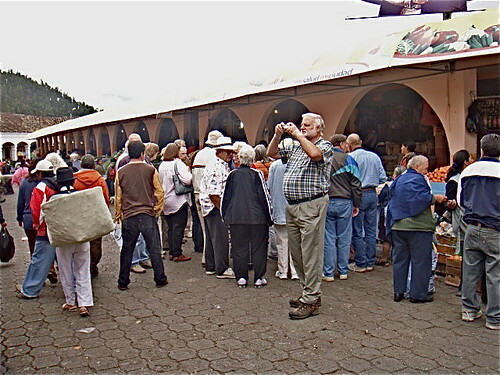 The courses uses unique lessons to provide Spanish fluency in a short time. Here is one example that gives access to thousands of Spanish words in less than three minutes. Anyone who knows this knows literally hundreds and hundreds of Spanish nouns. This is just one of seventeen Spanish lessons in the course. The next lesson teaches how to pronounce each of the nouns. Then the third lesson teaches almost as many verbs, almost as quickly. The fourth lesson shows how to avoid conjugating verbs by sticking with the infinitive (far easier than it sounds). This simple lesson leaves a person sounding like a Spanish professor without ever conjugating a verb. Lesson five shows how to sound infinitely polite and yet get almost anything desired in Spanish. Lesson six gives valuable connectors and the seventh lesson triples the Spanish capacity with three words for “yesterday,” “now” and “tomorrow”. By the end of one week delegates feel comfortable speaking Spanish without stress! Delegates are not stuck in a class room all day either. Each day they tour and use what they have learned. 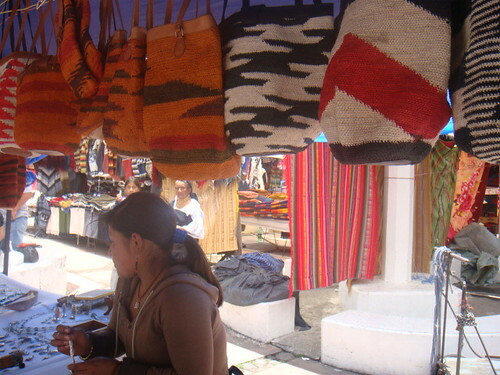 One day there is a visit to food markets… another to Otavalo the largest native crafts market in in the world. 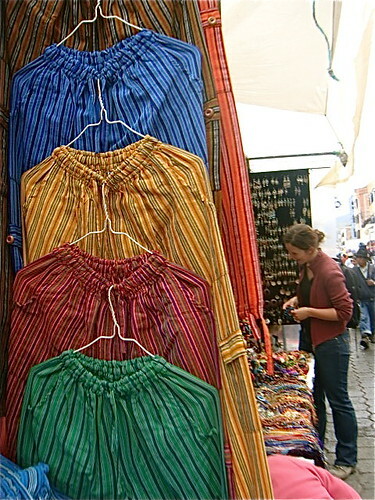 Another day in Otavalo, South America ’s largest indigenous market. Each lesson prepares delegates for that day’s trip so they can use what has just been learned. Each lesson is customized to the daily event so delegates can put what they have learned into immediate action! What is more the hotel stay can be as little as $59 night (per room) and tax (including a magnificent breakfast)! 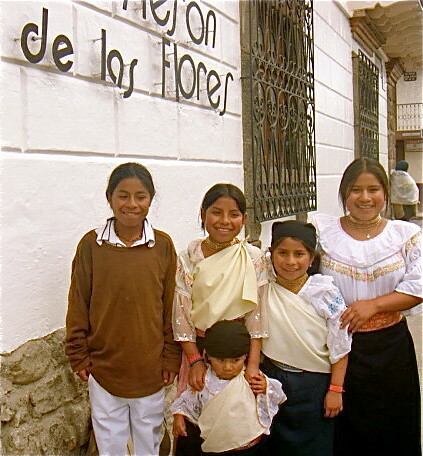 Land of the Sun also provide scolarships to educate Ecuador children like this. 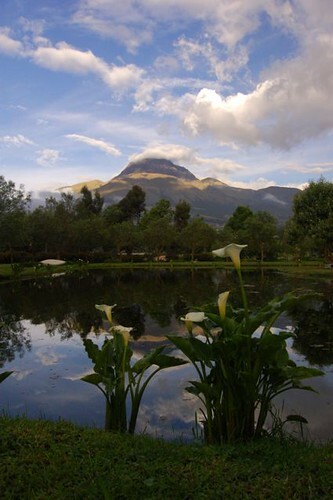 We hope you will join us in Ecuador, the Land of the sun. See our February 21, 2010 weekly review here. If you retire in Ecuador…plan to speak Spanish. 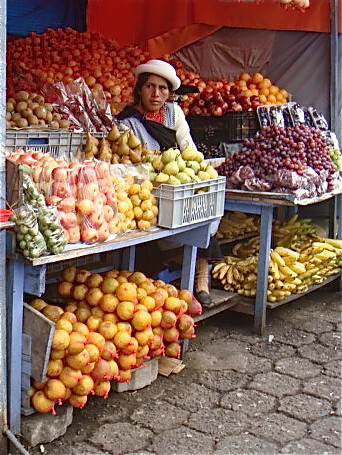 We visit the markets during our Ecuador Spanish course and practice what we learn. We receive notes from readers every day and this one especially reminds me that speaking Spanish when you retire or live in Ecuador can do more than just help you communicate. You passed the final exam. Congratulations! Our Super Thinking + Spanish courses do more than help you learn to speak Spanish or retire in Ecuador. They help you become more effective in everything. 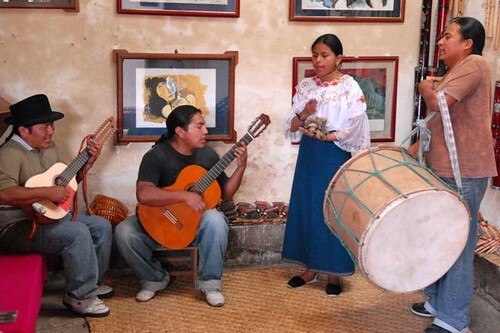 We enjoy indigenous music at our Ecuador Spanish courses. Our Super Thinking + Spanish course is about using our minds better. Learning to speak Spanish is just a side benefit! The ability to communicate in Spanish is really important. 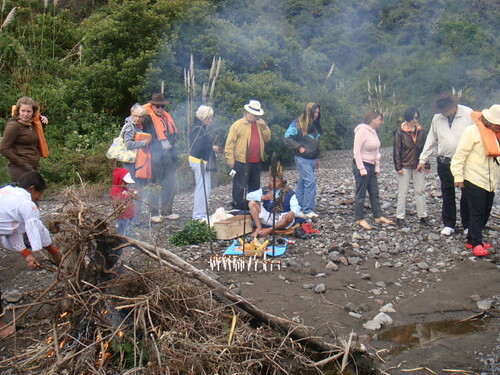 Delegates at a previous Ecuador Spanish course we conducted in Cotacachi. Spanish is the second most important language in the world. 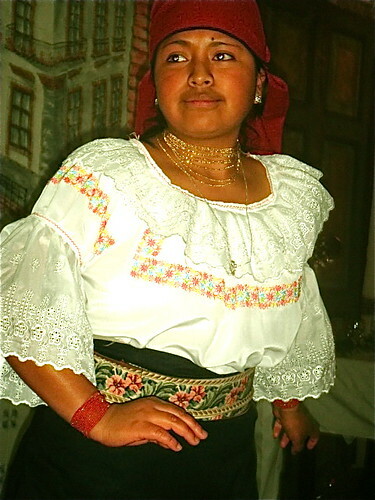 Our Ecuador Spanish course goes beyond Spanish. 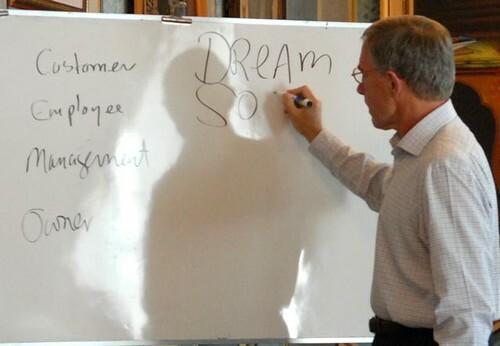 Super thinking is a method so revolutionary that in just a week you will be able to communicate…and even dream… in Spanish….plus much more. Super thinking helps you learn how to unlock the power of your untapped knowledge in a little known, but scientifically proven way of learning that enhances the speed, accuracy and efficiency of your decision making process. Super thinking improves your ability to absorb, retain and recall information. Merri was among those few who learned and is licensed to teach the Lozanov system and she has organized the Super Thinking program. 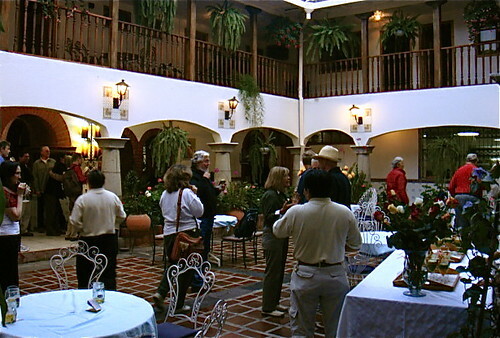 Whether you plan to visit, live or retire in Ecuador, Spanish can help you. Merri and I teach the Ecuador Spanish Course along with two native Spanish speakers. Super Thinking can help you even more. 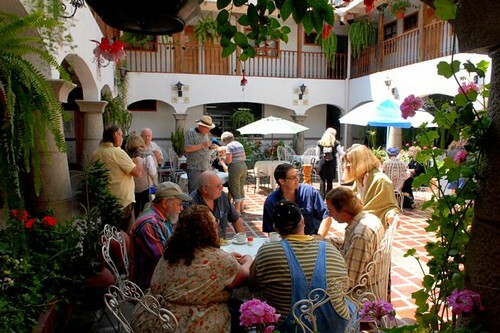 Enjoying a coffee break at our hotel Meson de las Flores during our Ecuador Spanish course.